UPDATED: As predicted, the chaos began within hours of the announcement that Donald Trump is the new president of the United States. Initial protests have become increasingly more violent and it’s spreading across the country like a contagion. This article was written a week before the election and the information here will help you to weather the storm should unrest arrive in your area. Will we all lose on November 8th? Darned if we do and darned if we don’t. That basically sums up the current election cycle. I’d go so far as to say that everybody loses during this election, especially if the promised chaos erupts when the winner is announced. Regardless of which candidate “wins” the presidential election, I have a bad feeling about the aftermath. I think we could be on the cusp of the most widespread civil unrest since the Civil War. For those who are wondering how things might go down, let’s look at some scenarios. There is so much anti-Trump wrath among Progressives that violence has already erupted at campaign rallies. Trump supporters had eggs and bottles thrown at them in San Jose, a police car was smashed and nearly 20 were arrested at a violent protest in Orange County, and a man was even arrested for trying to grab a police officer’s gun to assassinate Trump. And look at what Clintonites did to this homeless woman who was trying to protect Donald Trump’s star from being further defaced on the Hollywood Walk of Fame. Notice how many of these mob-minded cowards it took to terrorise one homeless woman…Classy, right? Now, think about how these people will react if Trump is somehow elected. If you have a sign in your yard, you will be a target for their rage. Got a Trump/Pence sticker on your car? Expect that it could be defaced. Even more recently, Penn State students were “triggered” by a pro-Trump rally and began tearing down signs, swearing at the pro-Trump kids, and disrupting their event. What’s more, it isn’t just Social Justice Warriors and Progressives folks would need to worry about. A top activist in the group, Black Lives Matter, took to Twitter to inform everyone exactly what would happen if Trump were to win the presidency. This was deleted but is archived here. Don’t delude yourself. With a Trump victory, trouble is coming. And don’t think living in a small town keeps you safe. The population of Ferguson, Missouri is barely over 20,000 people – hardly a metropolis. With all of the collusion, it seems like the FBI is fighting a tough battle to see her indicted. There once was a day that this suspicion would be enough to keep the American people from voting for a person who is blatantly in it for she can personally gain. The Wikileaks email scandal continues, with new revelations about our government leading to possible criminal proceedings, impeachment and heaven only knows what else. As well, there’s a very, very good chance that the election will be rigged. Somehow, despite all that is going on, Clinton’s campaign is still planning her celebratory fireworks party, scheduled to start several hours before all the votes could even be counted. And Walsh is not alone. Many Americans are sick and tired of the blatant, in-our-faces corruption. There is talk of revolution and even a quiet counter-coup going on behind the scenes. Others concur that unrest is coming. I’m not the only blogger out here in Bloggerland who thinks all hell will break loose regardless of who becomes presidents. Mike Adams of Natural News wrote, “My ANALYSIS of possible outcomes from the upcoming presidential election reveals that America only has a 5% chance of remaining peaceful after November 8. This does not mean the violence will occur on November 9th, but rather that events will be set into motion on that day which will lead to an escalation of violence (95% chance…) Check out his predictions of the possible scenarios. You need to get prepped. Immediately. What it all boils down to is that we need to be prepared. We need to be ready for any unrest that comes about as a direct result of the election – and I really believe that there will be some form of uprising against the result. I hope it will be nothing more than a few minor, isolated incidents, but I can’t get past the niggling feeling that all hell is just about to break loose. November 7 could be the last day of normalcy for quite some time. The governments of Germany and the Czech Republic have told their citizens to stock up on food, water and basic survival supplies in case of a national emergency. We need to be doing the same. If you would like to take a class to help you prepare for this, you can learn more here. If you don’t want to invest in a class, use this FREE handy checklist to make sure you’ll have everything you need. Make sure everything is in order. While it’s unlikely that services like internet, electricity, and municipal water will be affected, it doesn’t hurt to be ready for that possibility. The key here is to make certain you don’t have to leave your home for the duration of the unrest, should it come your way. Check your pantry and fill any gaps in your food preps. Order emergency food buckets – if you order right away there is still time to get them before the election. Get cash in small denominations out of the bank. Make sure you have enough garbage bags, pet supplies, and toiletries. Flashlight and spare batteries and/or dynamo wind up flashlights. Make sure all electronics are fully charged and keep them charged during election day. Make sure any cell phone battery packs are fully charged. Fill up your gas tank up to the max. If your vehicle isn’t in a garage park it trunk end in as close to a wall as you can. This makes it harder to get to the tank to either steal the fuel or set fire to it. Check your home security – walk around looking at your property as if you were a burglar and take appropriate action to improve security if required. Have something on hand for the kids to do in case of school closures. Make sure you have a fully stocked first aid kit and enough OTC medications to last the family for at least a month. As you can see, none of these preps is outrageous. They’re all things that you’ll use at some point if all is peaceful after the election. These preparations are reasonable and will stand you in good stead. I sincerely hope that America can pull together and that the divisiveness can end. But I don’t foresee that happening this week. Daisy Luther is a coffee-swigging, gun-toting blogger who writes about current events, preparedness, frugality, voluntaryism, and the pursuit of liberty on her website, The Organic Prepper. She is widely republished across alternative media and she curates all the most important news links on her aggregate site, PreppersDailyNews.com. Daisy is the best-selling author of 4 books and lives in the mountains of Virginia with her two daughters and an ever-growing menagerie. You can find her on Facebook, Pinterest, and Twitter. Copyright The Organic Prepper and Luther Inc. 2019. Feel free to share this information in full or in part in digital form, leaving all links intact, with full attribution to the author and a link to www.theorganicprepper.com. Please contact us for permission to reproduce this content in other media formats. The Organic Prepper website is a participant in the Amazon Services LLC Associates Program, an affiliate advertising program designed to provide a means for sites to earn advertising fees by advertising and linking to Amazon.com. The Organic Prepper Website is an affiliate of several other companies, from which commission is earned. The content on this site is provided as general information and entertainment only. The ideas expressed on this site are solely the opinions of the author(s) and do not necessarily represent the opinions of sponsors or firms affiliated with the author(s). The author may or may not have a financial interest in any company or advertiser referenced. We do not provide medical advice and recommend that you see your doctor before making any medical decisions. We do not provide financial advice and recommend you speak to a financial professional before making any financial decision. Any action taken as a result of information, analysis, or advertisement on this site is ultimately the responsibility of the reader. Copyright text 2017 by The Organic Prepper. 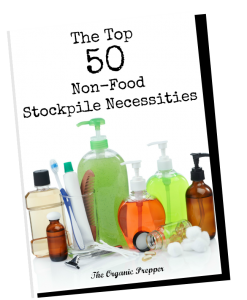 In the event of a long-term disaster, there are non-food essentials that can be vital to your survival and well-being. Make certain you have these 50 non-food stockpile essentials. Sign up for your FREE report and get prepared. 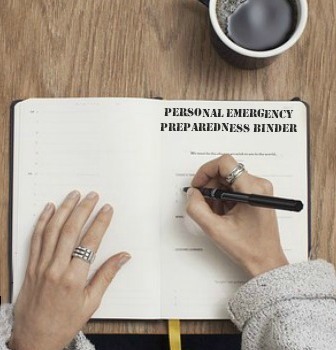 Every prepper needs a personal Emergency Preparedness Binder.